What is fired at 1,000 degrees, takes 2 weeks to make, and is brightly colored? Russian stove tiles! Muravleny izrazets made by CeramicaDecor, one of the Russian companies making souvenir tiles. 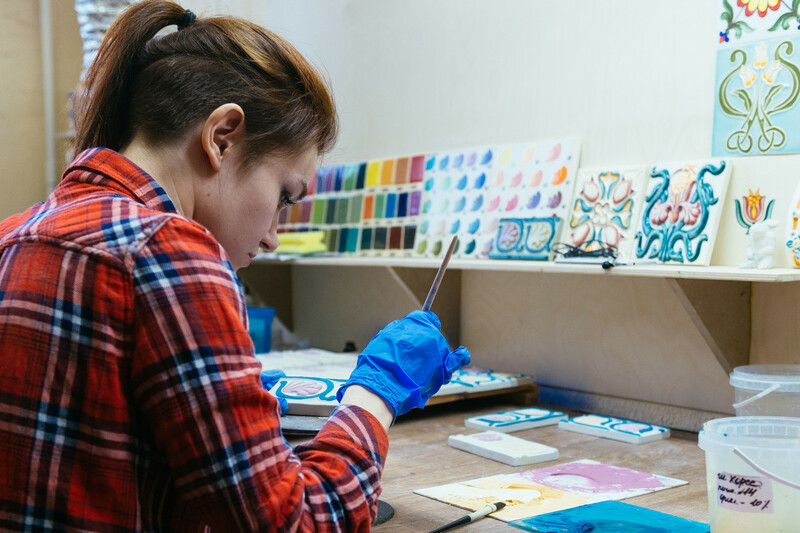 You probably never heard of them, but Russian glazed ceramic tiles occupy an important part in the history of the country’s applied arts. A popular element of home décor in the mid-17th century, izrazets has unique colors and traditional Russian themes, and is enjoying something of a revival in modern Russia. Since the days of ancient Rus’ the stove was a central element of life and culture, holding sacred significance as mediator between fire and people. In essence, it was the focal point of the household. Compared to European tradition, where the stove primarily was a heater and used for cooking, the stove in Russia had many functions - oven, bed (on top), home heater, banya and home of the domovoy, a protective house spirit in Slavic folklore. On the left: The stove from the Palace of Tsar Alexey Mikhailovich in Moscow. On the right: the stove from the Palace of Tsar Vladimir Alexandrovich in St. Petersburg. Both decorated with ceramic tiles. This art form most likely came to Russia in the early 16th century thanks to Western artisans, and by the mid-17th century it was widely used in the country. While Russian artisans initially deferred to European tradition, they eventually added distinct Russian features, such as bright colors, ornaments, and themes from Slavic mythology and daily life. 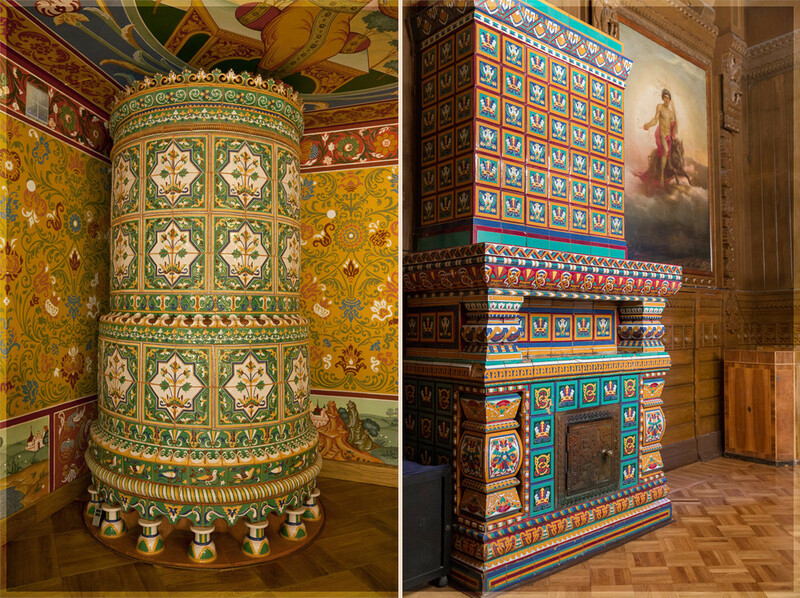 While examples of these brightly decorated stoves can be found in famous historical places in Moscow such as the Kremlin, Novodevichy Convent and the Kolomenskoye Estate, one also can find izrazets made by modern craftsmen and small factories that continue the centuries-old tradition of tile making. One izrazets takes as long as two weeks to produce. “The process of making izrazets has largely remained the same through the centuries. 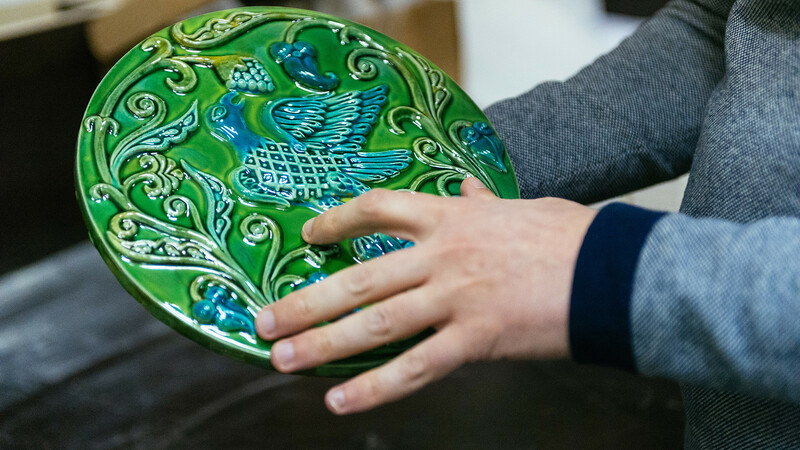 It’s quite traditional,” said Igor Frolov, owner of CeramicaDecor, one of the Russian companies making souvenir tiles, including the so-called muravleny izrazets, recognizable by its deep green color. “Everything starts with filling the form. The gypsum form is filled with a clay mass that also contains burned shards to make it able to withstand spikes in temperature,” Frolov said. On the left: A variety of patterns and designs for future izrazets. On the right: A raw clay model before firing. This is one of the key traits that make Russian tiles different from European ones. Owing to the difference in weather conditions, Russian tiles, especially those meant for external household decoration, are prepared at higher temperatures in order to better cope with freezing winters. Like many other types of Russian tiles, muravleny izrazets stands out with its unique ornaments and symbols from Slavic mythology and history. On such tiles, one sees everything from the Sirin bird, a mythological creature with the head and chest of a beautiful woman and the body of a bird, to images from Russian history. Frolov’s factory only uses images of real tiles that existed centuries ago, or still exist today in Russian décor. 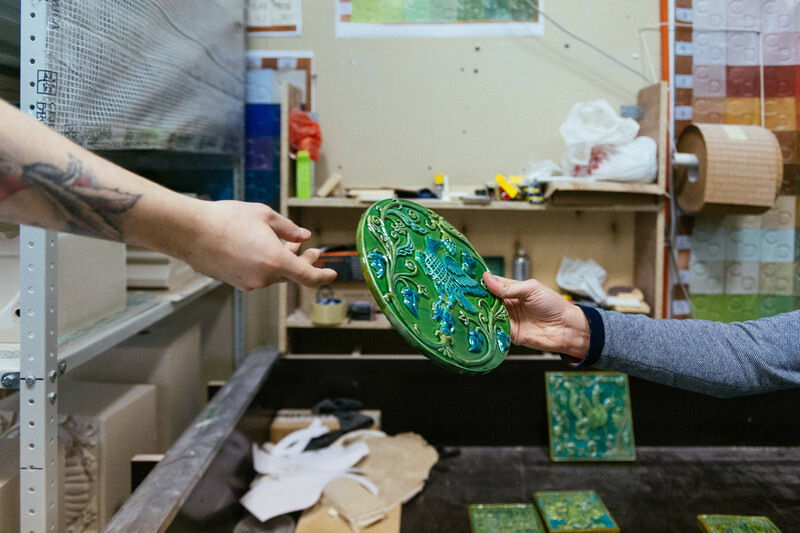 Unlike ordinary tiles used in modern households, and which can be bought in any store, izrazets is handmade, taking as long as two weeks to produce. One day is needed to make a raw clay model, then five days to dry, one day for firing, and then glazing and painting. This does not take into account the creation of the gypsum model! 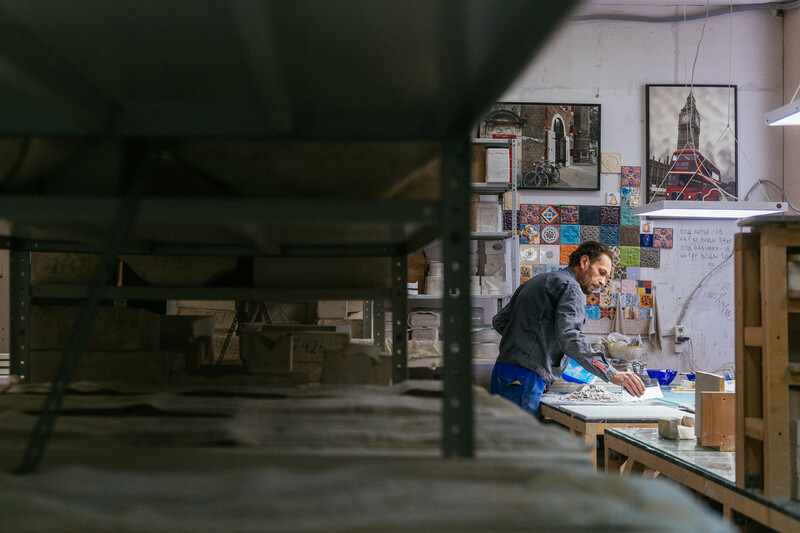 While many craftsmen make these tiles, one factor differentiates them – glazing. Each has their own secret of combining different glazes that gives the tile a unique color and depth. First, izrazets is placed in an oven fired to 1,000 degrees Celsius. Then, it’s glazed and fired once again at a lower temperature, which helps to give a distinctive shine. Similar to centuries ago, stove decorations today are mainly only affordable to the wealthy. Museums might order restoration work, but this is rare. Souvenir tiles such as muravleny izrazets are more affordable, and might be a good option for a foreigner hoping to find an unusual souvenir from Russia. No need to have a Russian stove at home! Want to know more about modern craftsmen who are rethinking traditional Russian handicrafts? Here is the story of an artist who creates stunning replicas of traditional kokoshnik tiaras – it’s also possible to buy them, if you wish.